Several of the men are wearing bowler hats, a few sport straw boaters, and the rest are wearing caps. Even the four ladies in the second row, in their Gibson Girl blouses, are wearing hats. The photograph appears to have been taken outside the factory. George M. Ross, grandfather of the donor, worked at American Seating Company for over 50 years. He is not in the photograph, but it was found in his belongings. 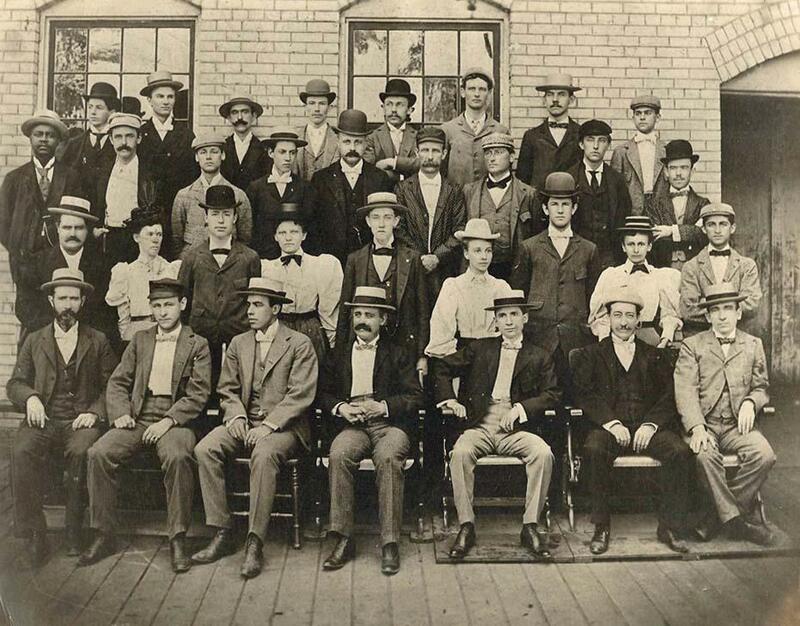 On the back it states, "Grand Rapids School Furniture Company, now American Seating Company, 1892 or 1893. Picture taken before the depression really took effect." That refers to the 1893 Panic, which was very hard on the local furniture companies. If you are able to identify anyone in the photograph please use our Contact Page. Grand Rapids School Furniture Co.